For the Revillas, campaigning is a family affair. And it’s not just because many members of the showbiz-political clan are actually running for public office. Even those who are not candidates are on the campaign trail, just like Cavite Vice Gov. Jolo Revilla’s son Gab. 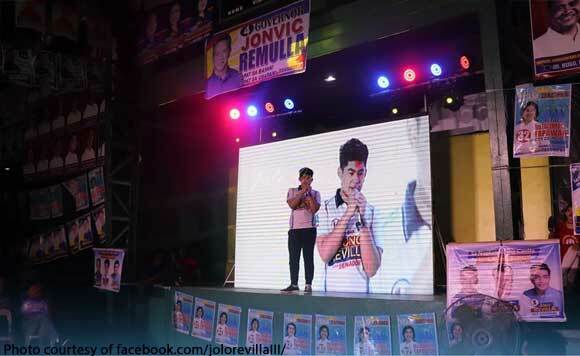 In a Facebook post, Jolo shared a photo of Gab addressing the crowd in Dasmarinas. Gab was very happy about the warm reception he received, the proud dad added. Looks like we’re seeing the next Revilla politiko in the making! “Maraming salamat, Dasmariñas! Lubos ang kasiyahan ng aking anak na si Gab sa mainit ninyong pagtanggap sa kaniya. <3,” Jolo posted.